I could not think of a better way to recognize “Father’s Day” than to dedicate this fun little post to MY dad! The “Father of the Father of Five”. It’s a “spin off” to my previous post (Graduation 2014 - #2 of 5) in which I eluded to something I wanted to share that was related to graduation, but not really about the graduation. You will (undoubtedly) see how it’s connected! This is my dad. The “Father of The Father of Five”. 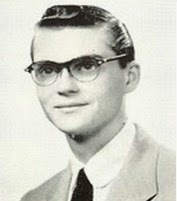 The “FoFoF” graduated from Roosevelt High School in June of 1955. This is his senior class photo. 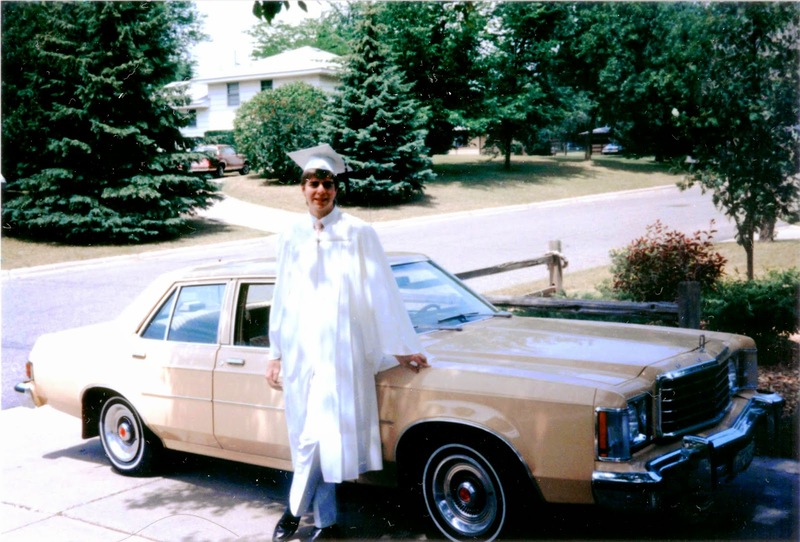 On the day of his graduation, his parents took his photograph standing next to his car. When he graduated, he was driving a 1946 Ford Sedan. This is his high school. The Father of the Father of Five. Graduation day, June 1955. Standing next to his 1946 Ford Sedan. 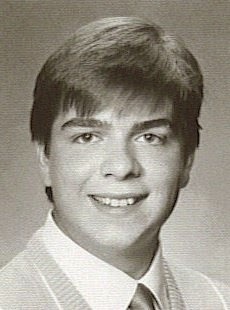 I graduated from the Academy of the Holy Angels in June of 1987. This is my senior class photo. 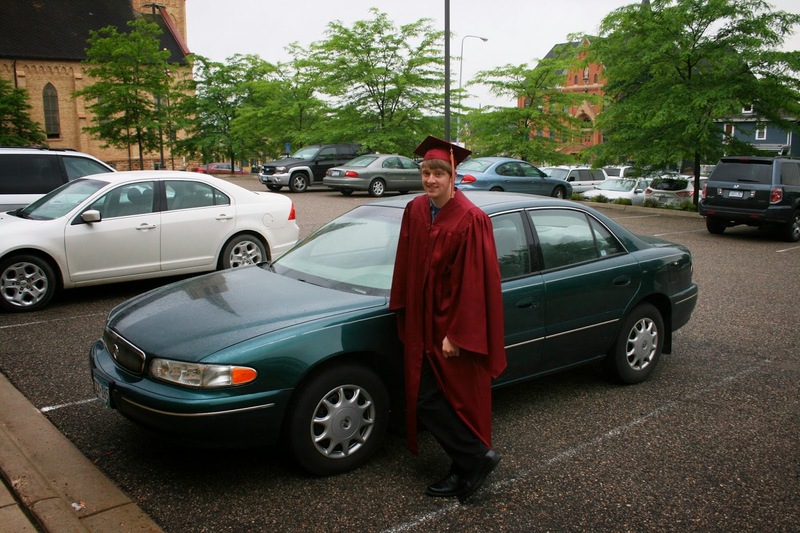 On the day of my graduation, my parents took my photograph standing next to my car. When I graduated I was driving a 1976 Ford Granada. 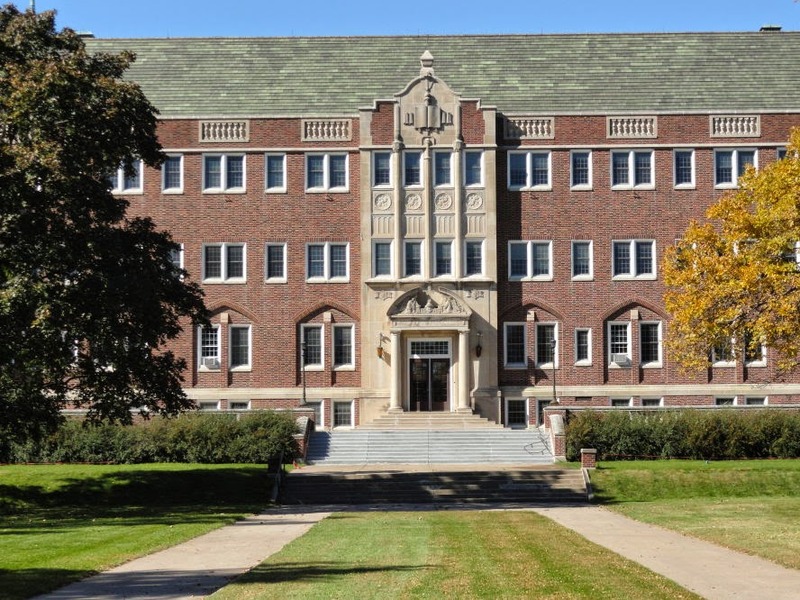 This was my high school. The Father of Five. Graduation Day June 1987. Standing next to his 1976 Ford Granada. This is my son. #2 of 5. #2 of 5 graduated from Jordan High School in June of 2014. This is his senior class photo. 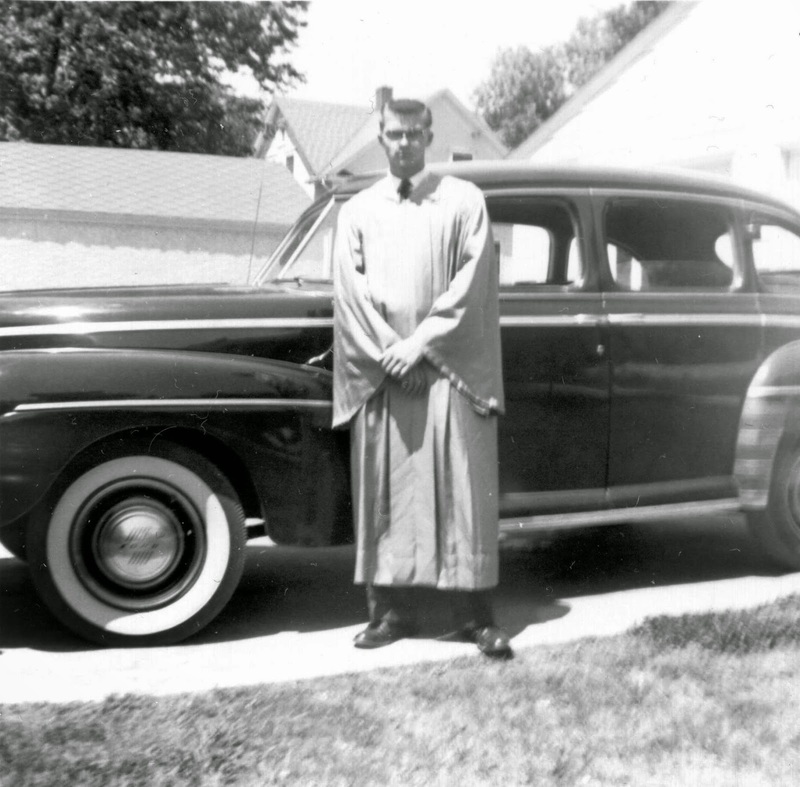 On the day of his graduation, we took his photograph standing next to his car. When he graduated, he was (and still is) driving a 2000 Buick Century. This was #2 of 5's high school. #2 of 5. Graduation day - June 7 2014. Standing next to his 2000 Buick Century. As promised (and... for just a little bit of ADDED FATHER'S DAY FUN), here is a photo I found of Roosevelt High School's 1955 Homerooms #325 and #328B. You may (or may not) recognize one of the faces in the crowd. #2 of 5 has graduated High School. For those of you counting, that’s “two down, three to go”. It’s been said before, and it merits repeating – time has a way of escaping if you are not paying attention. My advise for you fathers out there reading this is to slow down. Slow WAY down. Enjoy the moments while you are in them, because if you don’t – in the blink of an eye – you will be standing at your child’s graduation wondering just where the time went. Trust me on this one. I can not even begin to believe the concept that it’s been seven years since #1 of 5 graduated. A little background on #2 of 5. 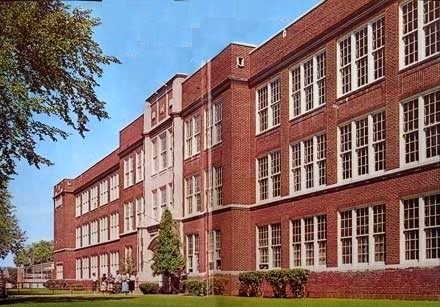 #2 of 5 attended St. John the Baptist School from Kindergarten through sixth grade (including two years of “Wee-Angels” preschool), then attended Jordan Middle School for seventh and eight grade. He moved on and completed his secondary education at Jordan High School for ninth through twelfth grades. He is (as of right now) currently enrolled, and begins his post-secondary education at Normandale Community College in the Fall! I am very excited for him! 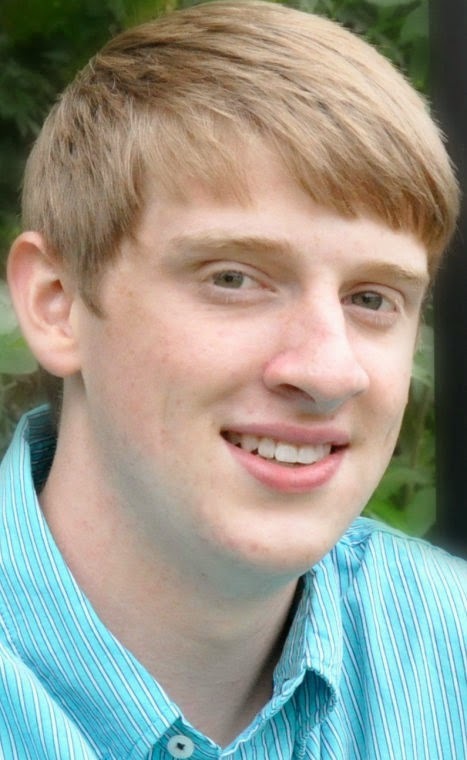 #2 of 5 is a very bright young man, who’s view of the world is one of equal treatment, and equal justice for all. While he did not graduate with “high honors”, I could not be prouder of him for the many important life lessons he picked up along the way. He has honed and calibrated his moral and ethical compass – and while I may not agree 100% with the direction the needle may point (but, it’s a good 98% that I can agree on) I have no doubt that the direction that compass is taking him in is both good, and the right direction. Be sure to visit #2 of 5’s dedicated page here on FOF. You will learn a lot more about this fine young man! Scheduled before the graduation ceremony was St. John the Baptist Church’s Graduation send off mass. The send off mass is the regularly scheduled Saturday evening mass (the time coincides well with the graduation ceremony), where graduating seniors join the entry procession, receive a special blessing by the congregation, follow the exit procession, and are provided a light lunch after mass in Louis Hall (the Church basement and kitchen area). One other special thing St. John’s does for the graduation mass is to break out this class’s First Communion Alter Cloth. (The green and white quilt over the main alter in the photo). This Alter Cloth is a quilt of “squares” made by these students as a project for their First Communion. Each student is to use felt, cloth, fabric paint, and the like to craft an image related to first communion. Then, each of the quilt squares are sewn together to make the Alter Cloth. This Alter Cloth is used on their First Communion (in second grade), their Confirmation (in tenth grade) and their Graduation send off mass (in twelfth grade). We used the Church’s Gathering Area before mass to get some family photos (which I won’t bore you with here). #2 of 5 (who has little to no patience for being photographed) did surprisingly well. After “a few” (~ahem~) photographs, we attended mass held by Fr. Timothy Yanta (our beloved Parish Priest) which was followed by the enjoyable Luncheon in Louis Hall. The idea of the luncheon is perfect (and I could not be more grateful for the Church doing it). There is only a short window of time between the end of the mass and the beginning of the graduation ceremony. Trying to coordinate a meal for our family between the two would have been difficult (at best). The ladies of the church did a GREAT job, and lunch was delicious! Their meal went a long way towards us being able to enjoy the graduation without the distraction of hunger! With all the festivities at St. John’s complete, it was time to head to the High School and get this kid graduated! 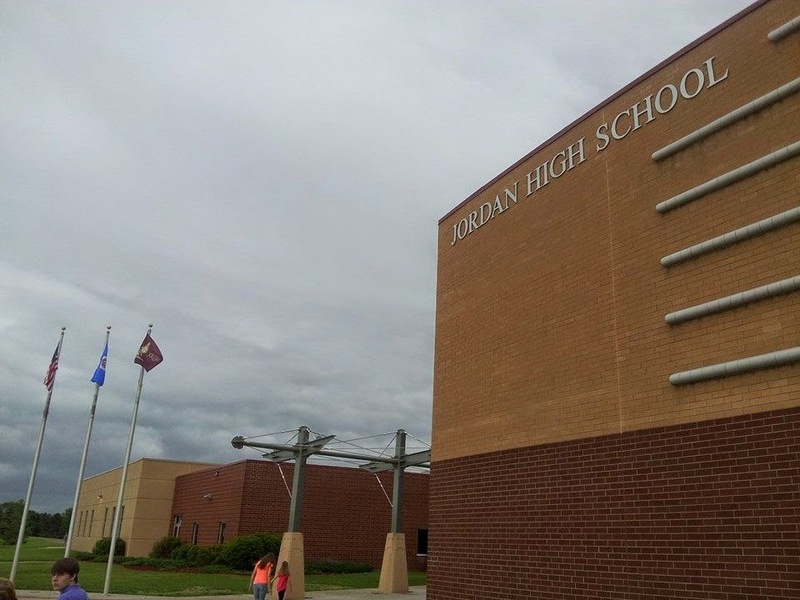 The Graduation ceremony was to be held at the Jordan High School athletic field, but due to a significant rainfall during the day, it was held in the Gymnasium instead. Seating was at a premium because it was held in the gym. Each family was allotted four tickets to the “main floor” and the bleacher seating was available for the remainder of the families. This led us to a small dilemma. We had five immediate family members attending (myself, the Mother of Five, #3 of 5, #4 of 5, and #5 of 5). We also had both sets of grandparents attending. Given the totality of the circumstances, the Mother of Five and I discussed it, and ultimately decided on giving our “main floor” tickets to #2 of 5’s grandparents. A couple of items in particular stood out on the stage. Two bouquets of white roses were present along with the diplomas. Each bouquet of roses represented a member of #2 of 5’s graduating class who’s presence at the graduation was in heavenly spirit. Chloe Fruth who lost her battle with cancer during their Sophomore year, and Mickenzy Segler who was involved in a fatal automobile accident during their Senior year. The ceremony itself was very nice. Both the band and the choir preformed throughout the ceremony. The festivities kicked off with the VFW holding a “posting of the colors” (displaying the United States flag) ceremony. This was followed with the opening remarks and a congratulatory address. At one point during the ceremony, the school staff acknowledged the students who have selflessly joined the armed forces, listing each student, and the branch in which they joined. Once each of these students were acknowledged, the crowd erupted in thunderous applause and a standing ovation. It was one of the most moving displays I have seen! A few more acknowledgements followed (Outstanding Seniors and Best Citizen Awards) before the Awarding of the Diplomas began. The moment finally arrived. #2 of 5’s name was called, and he began his walk to the podium to receive his diploma. Soon thereafter, the end of the list of graduates was reached. There was one last speech by one of the seniors (titled the “Graduate message”) before the Graduates proceeded out of the gymnasium and into the gathering area. The gathering area was quite crowded, but we were able to find a less chaotic corner for a post-graduation photo session. #2 of 5 (and each of the graduates) were given a bouquet of three white roses. I am not sure if they were asked to or not, but #2 of 5 had planned on giving one of three flowers to each of his grandmothers, and (I suspect) the final rose had him torn a bit. I think he wanted to give it to his mother, but I also think he also wanted to give it to his girlfriend. The Mother of Five (in what I think is a really cool move) preemptively told #2 of 5 that she thought it would be very nice gesture if he were to give his girlfriend the rose (thus removing any feelings of conflict or guilt he may be feeling). #2 of 5 did present his last and final Graduation Rose to his girlfriend. I tried to capture the moment in a picture, but missed it by about two seconds. I still got a photo just after it happened. There is a tremendous smile on this young lady’s face – and I have no doubt she enjoyed receiving the rose as much as the Mother of Five and I enjoyed watching #2 of 5 give it to her! Call me sentimental if you want, but this was one of my favorite moments of the evening!! With the ceremony over, gown turned in, and diploma in hand, (the newly graduated) #2 of 5 headed out with his class to the All Night Senior Party! I understand that he arrived back home around 4am (or so) before collapsing in exhaustion. I fully expected I would not see #2 of 5 “return to the living” until somewhere around 3pm – but while working outside (being careful not to wake him) - #2 of 5 came bounding out of the house around 11:30 am. I have another follow up post to this one – it’s related to graduation – but not just THIS graduation. It’s become a bit of a family tradition. 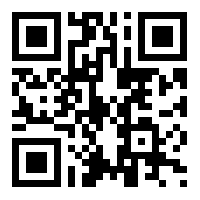 I will update THIS LINK once the post is complete.